Attaching emails to NetSuite from compose made is fast and easy. 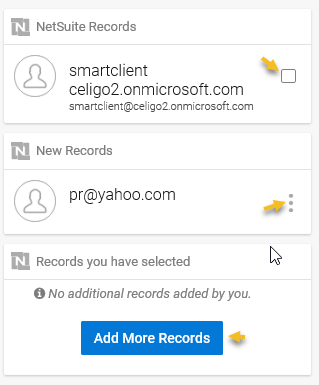 You can even add new records and attach the email to them without leaving Outlook. Enter in the recipient(s) of your email, the subject, as well as your message, and then click on the CloudExtend Icon on the ribbon bar as shown below. From this section you can attach to matching sender/recipient records, create new records, or search for more records. NetSuite Records : Matching NetSuite records auto fetched from NetSuite based on sender and recipient IDs. Check off the NetSuite records to attach the email to these records. New Records : If some of the contacts in To/CC/BCC fields are not in NetSuite , you will find a shortcut to create them here. Click on the "three dots" to add these as contacts in NetSuite and make them available for attachment. Records you have selected : In this section you can search NetSuite for more records (such as Customer, Vendors, Opportunities, etc.). Records you've selected from that search will be checked shown (pre-selected) here and available for attachment. You can repeat the search to attach to multiple record types. Once you are done composing your email, click attach in the task pane to attach the email to selected records. If you have added a few more contacts on in To/CC/BCC fields , click on refresh to autofetch corresponding NetSuite records. CloudExtend currently doesn't support file attachments in compose mode. If you want to attach email along with files, open the email from sent folder and then use CloudExtend to attach. Always remember to send your email after you attach it to NetSuite records. We recommend that you do not change the message content after attaching the email.